Women on Q&A: Why don't they like appearing on the show? 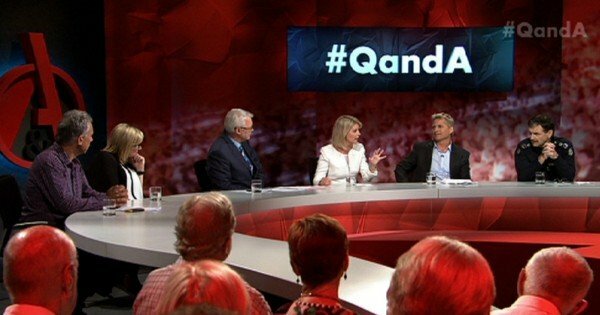 Producer reveals the disturbing reason why Q&A has a "problem" with women. That’s how one high profile woman responded when I asked her to join the Q&A panel. “I’d be terrified and I’d be terrible” she said, even though she’s addressed boardrooms and parliaments and is easily one of the smartest women I’ve met. And she’s not alone. I’m not outing anyone here — you all know who you are — but I’ve invited countless erudite and eloquent women onto the show, who’ve declined, dripping with apologies and self-doubt, quick to suggest other women, but just “Not me, oh God, not me!” Some of them are the very women who call for more female voices in public life. On the other hand, week after week I field relentless calls and emails from men, young and old, bristling with confidence and badgering for a spot. So, what’s going on? Some women tell me the show is too combative, too adversarial. Many admit they’re hopelessly polite. Brilliant listeners, not interrupters. But these are sharp witty women who love to talk and have me in stitches on the phone. The problem is, as Ray Martin so neatly puts it, “Q&A can feel “blokey”. 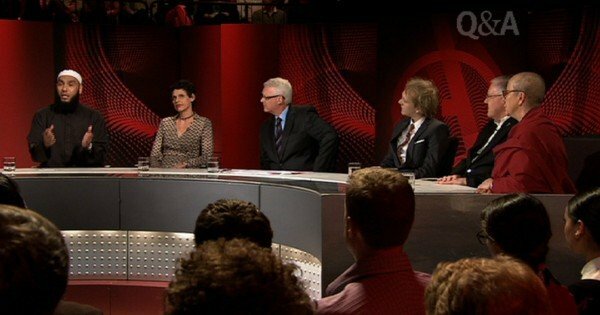 Watch: A question posed to one Q&A panel as to whether women should go into politics. Post continues after video. In part, that’s a reflection of Australia’s political culture. Q&A is designed to give people direct access to their political representatives, and with the gender imbalance in Parliament and the chronic shortage of senior female politicians, it’s tough for us to get the balance right. It’s made worse by the fact that politicians (mostly men) usually receive more airtime than non-politicians (often women). The Ray Martin/Shaun Brown editorial review is a well-researched and thoughtful analysis of six months of Q&A. It found that there were “fewer female panelists and those that were selected were asked fewer questions and permitted far less time to speak”. The end result: Female voices have become sidelined, and therefore diminished in the political conversation. That’s the bad news. 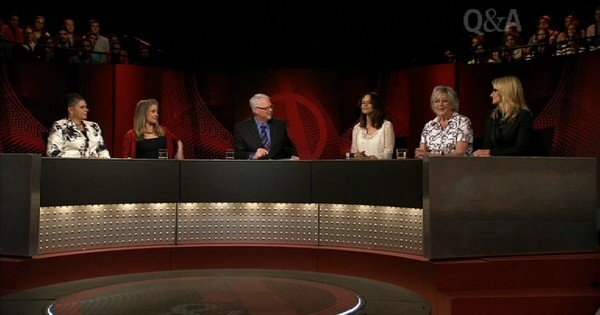 An all female Q&A panel back in 2013. Image via ABC. The good news is we have now put in place strategies to fix the problem. First up, we’re working even harder to increase the number of women on our panels. We’re shooting for a 50/50 target of male/female panelists over the 2016 season. We’ll also start to put strict limits on the pollies’ airtime, giving more time to the non-pollie guests, who are often women. And we’re travelling more… out of the Sydney studio to other state capitals and regional centres — which is a good way of tapping into a wider pool of women.We’re also aiming this year for more young panelists, under 35 and from more diverse communities. And we’ll be transparent about it. We’ll be publishing the data on our website to let people see how much time each panelist gets to speak. We won’t get the voice share perfect straight away, but we are actively trying to improve, and being open about it. 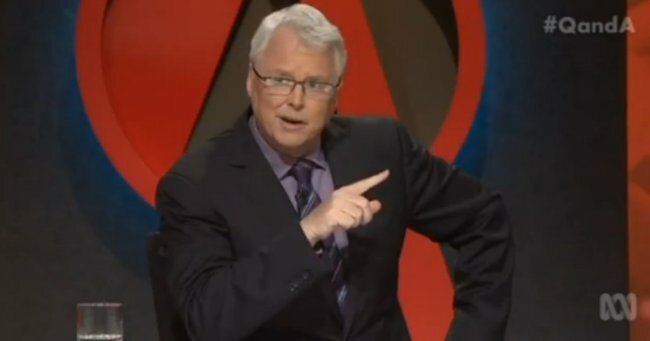 There’s one other very disturbing reason women have told me why they fear going on Q&A. It’s the well-founded fear that the online abuse and harassment they already suffer will increase. This is concerning for us all. So right now we’re working with Twitter to come up with a Safety strategy to equip all panelists with the best and latest practices for muting, blocking and reporting online abuse. And we’ll upgrade our own monitoring and reporting of trolls. In short, we are gonna do our damn best to open up the space for female voices and make the share of voice more even. But now we need women to step up and take that spot on the panel. Rest assured, most of those who were initially terrified, will end up loving the experience, and leaving elated. We’re a unique TV show worldwide. We can make you scream, break your heart and the next week change government policy. But we need all those talented opinionated women and girls and doubters to get on board. Don’t underestimate yourself and don’t bark from the outside. Get on the panel and spread your word. We can assure you on average nearly one million viewers, a massive, or massively increased, Twitter following after your appearance and cheap ABC wine in the Green Room. And by the way, tonight’s show we are doing out of Sydney — broadcasting live from a new studio in Docklands, Melbourne. We’ve lined up two male and three female panelists, including IR commentator Grace Collier, who swore she’d never come on, but has decided to give us a go. We’re back in Melbourne two weeks after that with feminist writer Clementine Ford in the mix. We’re planning some great specials, new locations and with the Federal Election looming, Q&A is poised to take off! Amanda has been Series Producer of Q&A for the past seven years. You can follow her on Twitter here.